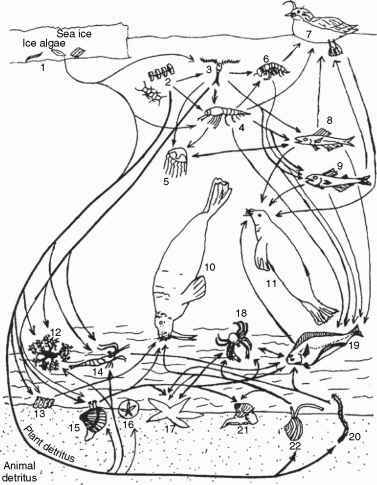 radiation, and desiccation; they can adopt a variety of growth, metabolic and morphological strategies; they can exude protons and metal-complexing metabolites, and form mutualistic symbiotic associations with plants, algae, and cyanobacteria. Most fungi exhibit a filamentous growth habit which gives an ability to increase or decrease their surface area, to adopt either exploration or exploitation strategies. Some fungi are polymorphic occurring as filamentous mycelium and unicellular yeasts or yeast-like cells, for example, the black meristematic or microcolonial rock-dwelling fungi. The ability of fungi to translocate nutrients within the mycelial network is another important feature for exploiting heterogeneous environments. Subaerial rock surfaces may be thought an inhospitable habitat for fungi due to moisture deficit and nutrient limitation although many species are able to deal with varying extremes in such factors as light, salinity, pH, and water potential, over considerable periods of time. Many oligotrophic fungi can scavenge nutrients from the air and rainwater which enables them to grow on rock surfaces. In the subaerial rock environment, they can also use organic and inorganic residues on mineral surfaces or within cracks and fissures, waste products of other microorganisms, decaying plants and insects, dust particles, aerosols and animal faeces as nutrient sources. Fungi may achieve protection by the presence of melanin pigments and mycosporines in their in cell wall, and by embedding colonies into mucilaginous polysaccharide slime that may entrap clay particles providing extra protection. It is likely that fungi are ubiquitous components of the microflora of all rocks and building stone and have been reported from a wide range of rock types including limestone, marble, granite, sandstone, basalt, gneiss, dolerite, and quartz, even from the most harsh environments. The elements found in soil reflect the composition of the Earth's crust, though some modification occurs by weathering, biogenic and anthropogenic activities which on a local scale may be pronounced: chemical changes include dissolution of rock minerals while biological activity causes enrichment of C, N, and S. Elements and minerals that remain can reorganize into secondary minerals. 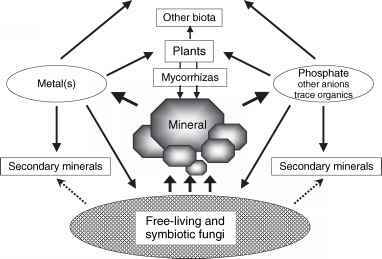 In the soil, fungus-mineral interactions are an integral component of environmental cycling processes (Figure 3). Mycorrhizal fungi in particular are one of the most important ecological groups of soil fungi in terms of mineral weathering and dissolution of insoluble metal compounds. Fungi are also important components of lithobiotic communities (associations of microorganisms forming a biofilm at the mineral-microbe interface), where they interact with the substrate both geophysically and geochemically and this can result in the formation of patinas, films, varnishes, crusts, and stromatolites. Biomechanical deterioration of rocks can occur through hyphal penetration and burrowing into decaying material and along crystal planes in, for example, calcitic and dolo-mitic rocks. Cleavage penetration can also occur with lichens. Spatial exploration of the environment to locate and exploit new substrates is facilitated by a range of sensory responses that determine the direction of hyphal growth. Thigmotropism (or contact guidance) is a well-known property of fungi that grow on and within solid substrates with the direction of fungal growth being influenced by grooves, ridges, and pores. However, biochemical actions are believed to be more important processes than mechanical degradation. Microbes and plants can induce chemical weathering of rocks and minerals through the excretion of, for example, H+, organic acids and other metabolites. Such biochemical weathering of rocks can result in changes in the mineral micro-topography through pitting and etching of surfaces, and even complete dissolution of mineral grains. Fungi generally acidify their micro-environment via a number of mechanisms which include the excretion of protons via the plasma membrane proton translocating ATPase or in exchange for nutrients. They can also excrete organic acids, while respiratory activity may result in carbonic acid formation. In addition, fungi excrete a variety of other primary and secondary metabolites with metal-chelating properties (e.g., siderophores, carboxylic acids, amino acids, and phenolic compounds). The weathering of sandstone monuments by fungi has been attributed to the production of, for example, acetic, oxalic, citric, formic, fumaric, glyoxylic, gluconic, succinic, and tartaric acids. Figure 3 Action of fungi on insoluble metal minerals in the terrestrial environment resulting in release of mineral components -metal(s), anionic substances, trace organics, and other impurities - which can be taken up by the biota as well as forming secondary minerals with soil components or fungal metabolites/biomass, and also be sorbed or otherwise removed by organic and inorganic soil components. The dashed arrows imply secondary mineral formation as a result of excreted metabolites as well as fungal action on nonbiogenic minerals. Possible losses to groundwater are not shown. composition. 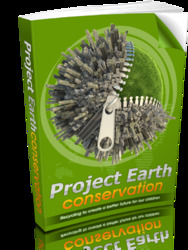 This process may be important in soil as precipitation of carbonates, phosphates, and hydroxides increases soil aggregation. Cations like Si4+, Fe3+, Al3+, and Ca2+ (that may be released through dissolution mechanisms) stimulate precipitation of compounds that may act as bonding agents for soil particles. Hyphae can enmesh soil particles, alter alignment, and also release organic metabolites that enhance aggregate stability. Microbial carbonate precipitation coupled with silicate weathering could provide an important sink for CO2 in terrestrial environments. In limestone, fungi and lichens are considered to be important agents of mineral deterioration. Many near-surface limestones (calcretes), calcic and petrocalcic horizons in soils are secondarily cemented with calcite (CaCO3) and whewellite (calcium oxalate monohydrate, CaC2O4?H2O). 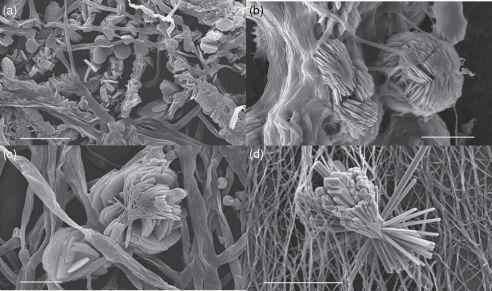 The presence of fungal filaments mineralized with calcite (CaCO3), together with whewellite (calcium oxalate monohydrate, CaC2O4?H2O), has been reported in limestone and calcareous soils from a range of localities. Calcium oxalate can also be degraded to calcium carbonate, for example, in semi-arid environments, where such a process may again act to cement preexisting limestones. During decomposition of fungal hyphae, calcite crystals can act as sites of further secondary calcite precipitation. Chitin, the major component of fungal cell walls, is a substrate on which calcite will readily nucleate. Other experimental work has demonstrated fungal precipitation of secondary calcite, whewellite, and glushkinskite (MgC2O4?2H2O) (Figure 4). Fungi can produce metal oxalates with a variety of different metals and metal-bearing minerals (Ca, Cd, Co, Cu, Mn, Sr, Zn, Ni, and Pb) (Figure 4). Calcium oxalate dihydrate (weddelite) and the more stable calcium oxalate monohydrate (whewellite) are the most common forms of oxalate associated with various ecophysiological groups of fungi. Depending on physicochemical conditions, biotic fungal calcium oxalate can exhibit a variety of crystalline forms (tetragonal, bipyramidal, plate-like, rhombohedral or needles) (Figure 4). Precipitation ofcalcium oxalate can act as a reservoir for calcium in the ecosystem and also influences phosphate availability. The formation of toxic metal oxa-lates may provide a mechanism whereby fungi can tolerate high concentrations oftoxic metals. It has been reported that oxalate excretion by fungi is enhanced with NO^ as a nitrogen source in contrast to NH^, and also by the presence ofHCO^,Ca2+and some toxic metals (e.g., Cu, Al) or minerals (e.g., pyromorphite and zinc phosphate). Figure 4 Mycogenic minerals associated with fungal biomass after growth in laboratory microcosms on various mineral substrates. (a) Glushinskite (Mg(C2O4) ?2H2O) and hydromagnesite (Mg5(CO3)4(OH)2?4H2O) on Pénicillium simplicissimum. (b) Moolooite (Cu2+(C2O4)?nH2O) (n < 1) on biomass of Beauveria caledonica. (c) Whewellite (Ca(C2O4)?H2O) on biomass of Pénicillium corylophilum. (d) Strontium oxalate dihydrate (Sr(C2O4)?2H2O) on biomass of Serpula himantioides. Scale bar = 20 mm (a, b); 10 mm (c); 100 mm (d). metal layer (patina) a few millimeters thick found on rocks and in soils of arid and semi-arid regions, called desert varnish, is also believed to be of microbial origin with some proposed fungal involvement. Fungi can oxidize manganese and iron in metal-bearing minerals such as siderite (FeCO3) and rhodochrosite (MnCO3) and precipitate them as oxides and also form dark Fe(ii)- and Mn(ii)- patinas on glass surfaces.